You guys are the most amazing parents with the most incredible daughter (and the best Grammy as well)! This trip was such a blessing! Glad you got your little angel back to being herself, full of smiles and giggles. Love her, love you all, thanks for posting these updates! Your precious daughter is an absolute angel, and your family is an inspiration to all of us around you. You are all so amazing. Your strength and faith is such an incredible example to others. Praying for you all! Awesome stuff!! I am so glad she is feeling comfortable and happy and that you are all making happy memories. I'm so glad to hear things are getting better. She is adorable and you are such great parents. I am Reesa's grammy and went to Pittsburgh with her parents. Dr Escolar and her staff are amazing We saw immediate changes in Reesa. Dr Escolar doesn't pretend to extend the lives of these babies, but she can make a difference in the quality of their life. I think it was a very worthwhile trip. Hi Jamie & Sean. Been in contact w/ Dad...we still pray for you and think of you a lot. THANK GOD to the 100th power for Grammy Flo!!!!!! Enjoy every minute - Reesa is so cute! Glenn, Laurie, Bobby & Amy. I am a mother of a special needs child but I can't even begin to understand all you are going through. 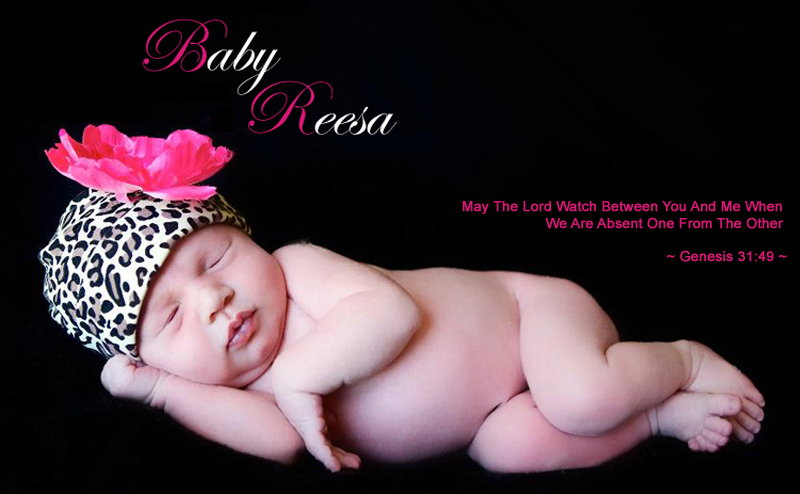 What I can understand is how much you love baby Reesa with everything you have and that's what matters most. She is a beautiful precious gift from God who I'm sure has made an impact on many, many lives. My prayers are with all of you. God bless you.